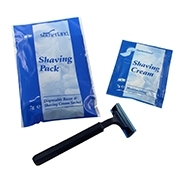 Sutherland Shave Packs are part of a range of patient hygiene products. Sutherland is a trusted and established healthcare brand, and a leading supplier of personal care products to the NHS. Each individual pack contains a 7g single-use sachet containing our own moisturising shaving cream and one disposable twin-bladed razor with added lubricating strip. The razor is packaged with protective safety cover. The shave cream is gently fragranced and has moisturising properties that helps hydrate the skin leaving it soft to the touch. Sutherland Shaving Cream has been approved by the Vegetarian Society. These packs are used by hospitals, care homes and hospices where they can help reduce the risk of cross infection and are easy to open. The packs are proudly manufactured in the UK. Sold in packs of 25. Sutherland Health can also supply shave cream sachets and disposable razors separately.